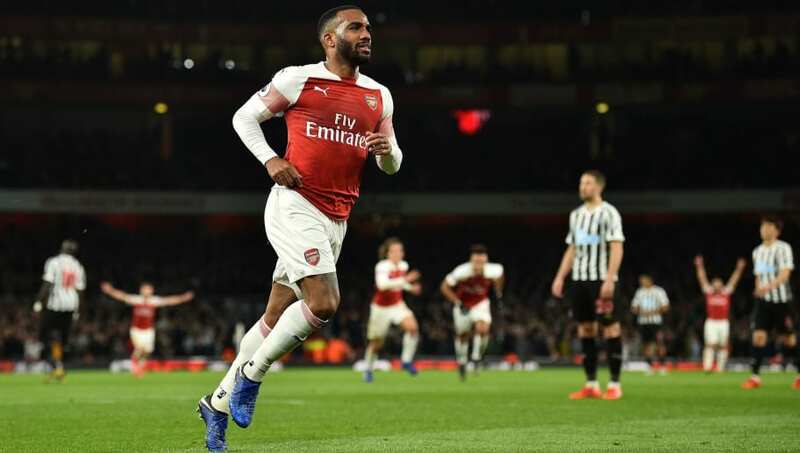 Arsenal gave their challenge for Champions League qualification a huge boost as they beat a toothless Newcastle United 2-0 at the Emirates Stadium on Monday night. It was a tale of two first half goals for Arsenal and especially Aaron Ramsey, as the midfielder thought he had given the Gunners a flying start to the match, smashing in at the back post following a Saed Kolasinac flick on from a corner. A foul by Sokratis on Newcastle's Florian Lejeune whilst tussling in the penalty area however saw referee Anthony Taylor cut the Welshman's celebrations short. ​Ramsey did however have a goal to celebrate on the half hour mark, as his low left footed effort from just inside the box found the back of Martin Dubravka's net via the inside of the post. ​Arsenal's dominance continued into the second half as they maintained the majority of possession, keeping ​Newcastle at arms length, with the visitors unable to lay a hand on their hosts as they searched for an equaliser. The game and the points were made safe late on in the second half via some terrific combination play from ​Alexandre Lacazette and ​Pierre Emerick Aubameyang, with the former lifting the ball delicately over the keeper to double Arsenal's lead. Here is a breakdown of Arsenal's victory on Monday night. On paper, this fixture looked as though it may be a routine victory for the Gunners, however with the dangling carrot of moving into third in the Premier League table and with Newcastle still searching for points to secure their league status, it could have proved to be anything other than straightforward. There was no clear signs of pressure and jitters during the Gunners' performance, with Unai Emery's team seeing off Newcastle professionally, suffocating their opponents. Despite there only being a single goal between the teams for a long period of the game, it never seemed as though Arsenal would fail to win. The announcement that Aaron Ramsey would be departing the Emirates for ​Juventus at the end of the season seems to have coincided with the Welshman becoming a key and influential member of Unai Emery's team. Prior to kick off, the 28-year-old was awarded the captain's armband with Laurent Koscielny absent with injury, and it was a leader's performance from the Turin-bound midfielder, as he orchestrated the play from deep and tried to find holes within a compact Newcastle defence. The finish for his goal was classy, controlling his first time left footed strike across Dubravka. It was unfortunate that injury cut short his masterful display just after the hour mark. Again he’s going for nothing. #Ramsey #Arsenal. A defensive approach from Rafa Benitez's side was clear from the off, however the plan also consisted of looking to catch the Gunners on the counter attack. The first half resembled something of a training exercise, as Arsenal came forward in endless waves looking to breach the defensive barrier, with the Magpies defenders only earning any respite when they thoughtlessly hoofed the ball clear. Despite their need for an equalising goal, very little changed in the second half. Rafa Benitez and his team will be left to wonder what could have been for them had they freed themselves to be more expressive in attack. Despite playing in a more restrictive role at left wing back, Ritchie put in a workmanlike and combative performance, showed plenty of energy and ability to defend as well as try to provide another option going forward in Newcastle's rare ventures into the Arsenal half. He also performed a miraculous goal line clearance to deny Arsenal a second goal before half time. Unai Emery's side will look to build on victory against Newcastle as they travel to Goodison Park on Sunday to face a resurgent ​Everton, who have won their last two Premier League matches. Newcastle return to St James' Park on Saturday afternoon as they face Roy Hodgson's ​Crystal Palace in their next Premier League fixture.